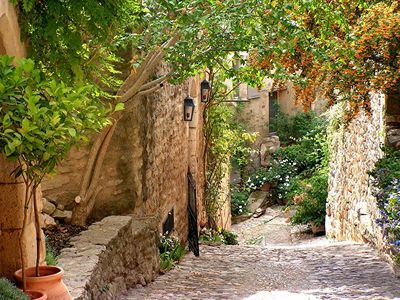 Lacoste is a small "hilltop" village (villages perchés) in the Luberon and it's really a treat to wander these small cobbled streets feeling like you are entering the past... Going up in the village you will reach the Marquis de Sade's Castle at the very top of Lacoste. It looks like a ruin at first but has been partially renovated since the 1950s, first "by one man as a labour of love", and later by the fashion designer Pierre Cardin. You can fly from Paris Charles de Gaulle airport and take a flight down to Marseille (about 1 hour), then rent a car to Lacoste (about1 hour). * The nearest airports are Avignon, Marseille, Montpellier or Nimes. Then you can rent a car to get around. You also have the option of taking a TGV to Avignon or Marseille and hire a car.. Here  is a really beautiful timelapse film shot in Lacoste by Nicholas Reichard, while he was studing art there. This page was last edited on 25 July 2013, at 00:22.